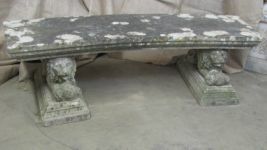 English Reconstituted Stone Garden Seat; A mid-20th century beautifully weathered English reconstituted stone garden bench with a slightly curved slab seat supported by fully formed recumbent lions on rectangular stepped bases. Early 20th Century English Birdbath; Charming and beautifully weathered English early 20th century four section birdbath. Large Reconstituted Garden Tortoise; What fun! 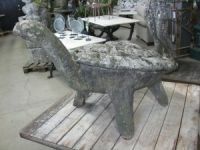 A whimsical reconstituted stone tortoise with removable hard shell that lifts off to reveal a great planter. French. Mid-20th century. 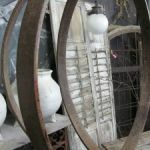 Garden Orb; Antique wheel staves assembled into a sphere and mounted on a 19th century English Gothic revival reconstituted stone base create an impressive ornament. Charming Statue of a Faun; Turn of the century English hand carved marble statue of a faun playing his pipes, on an associated cast stone pedestal. Extremely well modeled. 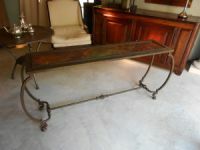 Wrought Iron and Onyx Console; Handsome mid-20th century Belgium console table with graceful sweeping wrought iron base with a mottled bronze patination reminiscent of Diego Giacometti and beautiful inset onyx stone top. 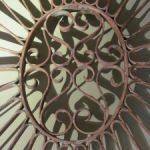 Large Wrought Iron and Wood Window Frame; A very large 19th century French iron and wood window with an interconnecting pattern of wrought iron scrollwork. It is likely that originally the window would have been glazed. This piece can be ..
19th Century Carved Stone Lion Fragment; Over time this early to mid-19th century English hand carved stone lion has lost his legs but with fabulous detail and a wonderfully expressive face he still cuts a fine and impressive figure. Now on..
Large 19th Century English Bust; A large and impressive bust of a Bacchanal. English, late 19th century. This imposing fellow was likely at one point part of a larger figural piece but certainly is capable of holding center stage ..
Carved Stone Fountain Group; A substantial late 19th century Continental carved limestone fountain group of two draped putti embracing a dolphin on an associated stone plinth. Lovely moss and lichen covered surface with the dolp.. 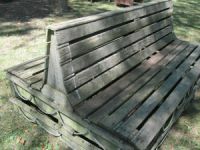 Matched Pair of 19th Century Cast Iron Benches; Matched pair of mid-19th century cast iron benches with foliate cresting, horseshoe form trellis backs, graceful cabriole legs and scrolled seats, all with much evidence of early paint. One of the ea.. 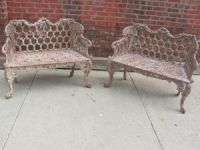 Pair of Oversize French Rattan Chairs; A striking pair of early 20th century French rattan chairs which likely decorated a conservatory or garden room. 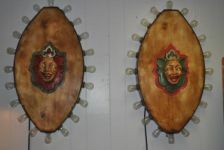 Pair of American Lighted Carnival Medallions; Pair of 1930's metal carnival medallions with clown faces., each surrounded with lights. French Flower Cart; A charming late 19th/early 20th century wood and wrought iron French flower seller's push cart. Rare Set of Four Pulham Urns; A set of four large matching terra cotta urns with deeply lobbed bodies and ring handles by James Pulham, Boxbourne. Circa 1860 Established in 1820 the terracotta firm of James Pulham began making ga.. 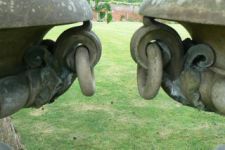 Impressive Large English Terracotta Urns; An impressive pair of monumental English Victorian terracotta urns. 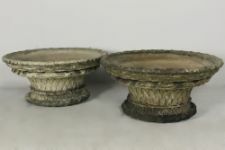 With egg and dart rims the deeply gadrooned bowls rest on fluted bases embellished with a rope twist. Circa: 1890. Pair of English Basketweave Terracotta Planters; A beautifully designed and executed pair of English 19th century terracotta urns with basketweave bodies and broad rims, in a lovely weathered surface.